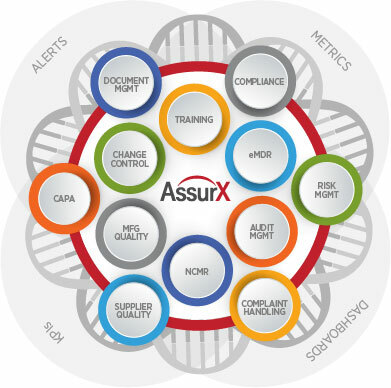 AssurX Inc. - QUALITY + COMPLIANCE SYSTEMS FOR EVERY ENTERPRISE. The AssurX quality management system (QMS) software platform offers an easy-to-use, flexible, integrated set of quality management system (QMS) software solutions designed for FDA-regulated manufacturers. With one system you can improve quality and compliance, streamline workflow, control risk and better manage your enterprise. No other automated quality management system (QMS) is easier to deploy, use and modify. Using AssurX quality management software, you not only know immediately when an issue arises (from any source: customer, supplier, internal), all relevant areas of your organization share the information needed to contain, evaluate and quickly resolve the problem. One system of seamlessly connected solutions to improve quality, ensure compliance, manage risk and streamline workflow. Every solution built for FDA, ISO and cGXP. Seamlessly integrated electronic medical device reporting (eMDR). Automatically orchestrate and track activities, share data and communicate information to the appropriate parties. Dashboards provide live, clear views of coordinated activities and information across all areas of the business. Manage operations while detecting, correcting and preventing potential issues. Simple to deploy, configure, use and modify. Powerful real-time trending and analytical tools. Available as either traditional OnPremise (licensed software) or OnDemand (cloud-based SaaS). Ready-to-use quality and compliance software solutions are part of the core AssurX quality management system (QMS) platform and work together seamlessly—sharing a single source of data and informing one another. With the AssurX quality management system (QMS) platform you can start with just the solutions you need, then easily bring new quality and compliance processes online as you’re ready. AssurX’s closed-loop solutions deliver fully FDA-compliant processes for integrated, corrective and preventive action (CAPA), complaints management, supplier quality management, document management, risk management, training management, change management, audit management, overall product quality management, electronic medical device reporting (eMDR) and more, while a state of control and proof of compliance is maintained continuously in one central, securely accessible system. We’re proud to keep good company. Medical device companies of every size—that’s 10s of 1000s of users worldwide—rely on us each day. AssurX is an ideal partner for medical device companies looking for better operational control and efficiency while staying compliant. How Will Real-World Evidence Impact 2017 FDA Guidances? Is Your Change Control Program Ready for FDA 510(K) Scrutiny? AssurX quality management system (QMS) software is designed to support requirements and standards for the FDA regulated medical device manufacturing industry. AssurX boasts mature compliance management capabilities with extensive audit trails, security controls, and electronic signature and records functionality that meets or exceeds rigorous standards regulatory requirements. In addition to FDA’s stringent 21 CFR Part 11 and 21 CFR Part 820 and CGXP requirements, medical device companies also face serious regulatory scrutiny from the Department of HHS and its HIPAA patient privacy regulations. It is incumbent upon medical device manufacturers to use software, hardware, and system processes that ensure only those personnel required to see a given piece of data are in fact allowed to access it. For more information contact AssurX Inc.